Even though most of what goes on here is knitting (and occasionally spinning), I have an interest in all kinds of crafty things. 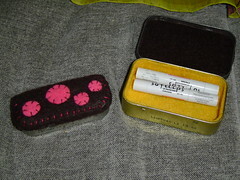 i often sew specialized knitting needle cases for sock knitters, and zippered bags (sometimes embroidered). i enjoy sewing because if you have a design idea, it takes much less time to try out the finished product than with knitting. Lately I have also been making buttons and stitch markers. 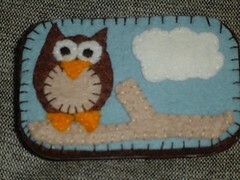 Proabably my most favorite crafts that i have worked on lately are my felt-covered altoid tins. I just traced around the edges of the tin to make a template for myself and i cut out a background piece. then I sew on the cuteness. Some more stitching and some E6000 later, Viola! They are perfect for holding stitch markers and other knitting/sewing notions. And you don’t sound like a gypsy when you carry them around in you bag, because the felt lining keeps everything nice and quiet. They are also the perfect size for a chapstick and maybe even a few bucks. but the cute little owl is a close second. So I will say that the tv-dinner tin is my entry in the whiplash competition this month. 15 Responses to "Altoid tins are the perfect home for everything." Those are terribly cute. I’ll have to go a-beggin’ for some altoid tins. (I’m allergic to mint. Boo!) I wanted to see the pics for the sock knitter cases, but the pictures don’t show. Show us again, please! That is so cute! I love the tv dinner one. 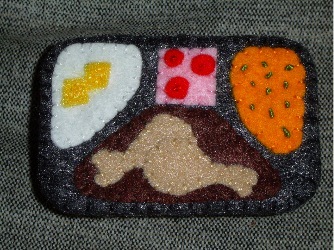 those are so cute and clever – and the tv dinner one… awesome! mucho cuteness! I like the idea of reuse/recyle. And the tv dinner is too cute. Wow. Thise are so freaking cute! I just threw away a few Fossil watch tins that I’ve had forever. I had no idea what to do with them and now they’re gone! This would have been perfect! That’s it, I’m never throwing anything away again. How about a little tutorial? I’d love to make those as well! So cute, especially the owl! These are so adorable! I don’t like altoids, so I’ll hafta beg some friends for empty tins, I just can’t wait to try this for myself! 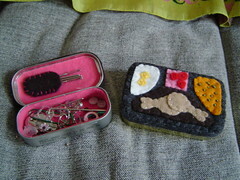 I LOVE the little sewing kit! I love the tv dinner tin–so cute and cleaver! What a great idea. I use altoide tins to store change, usually. I’ll have to consider decorating them now, too. what kind of glue do you use to attach to the tin?